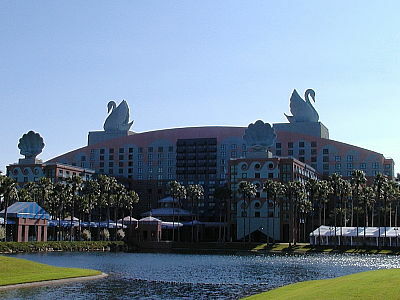 Over the years, Walt Disney's Swan and Dolphin hotels on Walt Disney World property have often provoked strong negative feelings among Disney fans. Now, a five-year makeover of the hotels that is estimated to cost over $60 million dollars is due to be completed by September. Tishman Hotel Corporation Executive Vice President Dave Bagwell stated, "It's a total redesign. Entertainment architecture has had a very successful run, but it's time for a fresh new look." Tishman is the managing partner of the hotels' ownership group. These are the only hotels carrying the Disney name that are not operated by Disney and do not offer the same amenities as the other Walt Disney World resorts. "Entertainment architecture" is a Disney term coined by Michael Eisner, where the architecture outside the boundaries of the Disney theme parks but still on Disney property should embody the same fantasy and sense of story as the structures in the park. In 1996, Eisner told me that he felt the two legacies he would leave to the Disney culture would be culinary improvements and entertainment architecture. From the Burbank studios to the Disneyland park to the Contemporary and Polynesian at Walt Disney World, in many ways, the Walt Disney Company has always been a pioneer in architecture. However, by the time Michael Eisner became Chairman and CEO of the Disney Company in 1984, the company's connection to innovative architecture had faded. Eisner rejected a plan to build two rather ordinary hotel towers (that in my conversation with him, he referred to as "refrigerator boxes") near Epcot. After some legal wrangling with the Tishman Corporation, Eisner hired the award-winning Princeton architect Michael Graveswho had never designed a hotel beforeto design the Walt Disney Swan and Dolphin hotels. The hotels were necessary to accommodate the convention groups who were staying at off-property hotels that had greater convention space than the existing Disney resorts. When the two hotels opened in 1989 and 1990, they offered the largest hotel convention space in the Southeastern United States. Michael Graves is often described as putting the frequently controversial concept of postmodernism on the map. His works range from large projects such as buildings to whimsical designs for furniture, teapots, and other household items. In March 1997, Graves did a presentation at the Disney Institute Performance Center on his projects for the Disney Company. Afterwards, several of us took Graves to Seasons restaurant to continue the conversation. And during that informal get-together, Graves revealed some further insights into his work for the Disney Company. At the time, Graves was working on the post office for the city of Celebration that he described as the "smallest building in the city" and was amused that he was responsible for the smallest building and the largest building (Walt Disney Dolphin hotel) on Walt Disney World property. Earlier, Graves had designed the Team Disney corporate building in Burbank, California. Graves said when he was in meetings with Michael Eisner, Michael told him: "Look, everyone here will have some design priorities for you but I only have one priority. When I come in to work each morning and go up to my office, I'll probably have very little to smile about. So do something that will make me smile when I arrive." Graves, whose first name is also Michael, took to calling Eisner: "The real Michael." One day he was talking to Eisner on the phone and Eisner said, "I have to call you back. On the other line is the really real Michael." It turned out to be Michael Jackson. When his first designs for the Team Disney building were rejected, Graves came up with the concept of having the Seven Dwarves as caryatids. A caryatid is a sculpted figure serving as an architectural support taking the place of a column or a pillar supporting horizontal bands. "Because Snow White and the Seven Dwarves was truly the foundation of the Disney Studios and supported the growth of the company just as the dwarves are supporting the building," claimed Graves. Graves commented on how he can't "relate to the three-dimensional costumed Mickey Mouses walking around Epcot. To me, Mickey is two-dimensional. I used to draw him that way when I was 6 or 8. Seeing this 3-D figure who never talks, lumbering up to me and raising and lowering his hand, that is not Mickey Mouse." The majority of our conversation centered on the Walt Disney Swan and Dolphin hotels. Graves was more than happy to reveal his thinking behind the choices he made and to share the story of the hotels that has never before appeared in print. Disney's Swan Hotel. Photo by Alex Stroup. The "black box" area on the Walt Disney Dolphin that many Disney fans mistakenly believe was meant to be an entrance for the monorail similar to the Contemporary resort is actually the heart of a mountain. The Walt Disney Dolphin is a mountain that has struggled to thrust its way out of the tropical rain forest. That is the reason for the banana leaves painted along the side of the building. The struggle caused the heart to explode, and the water cascades nine stories down the side of the hotel, passing through five clamshell basins to a fountain and eventually splashing into Crescent Lake. Notice that the walkway from the Walt Disney Dolphin to the Walt Disney Swan has railings and landscaping that mimic waves. The water splashes up onto the Walt Disney Swan and that accounts for the waves painted on the side of that hotel. Two birds were so awed by this spectacle that they alighted on the top of the waves to get a better look and were magically transformed into swans. Graves deliberately selected two creatures that "were not part of the existing Disney mythology" but had hopes that they would then be developed further as Disney icons once he had selected them. The dolphin image was inspired by the work of Italian sculptor Gian Lorenzo Bernini. An example of Bernini's dolphins can be seen in the King Neptune fountain in the Italian pavilion at Epcot. However, there is a major difference that Graves pointed out to us. Bernini's dolphins had mouths that curved downward, and Eisner insisted that wasn't going to happen on Walt Disney World propertyso Graves' dolphins have their mouths curved upwards as if smiling. Designed by Graves, the swan statues (like the dolphin statues) are created from steel, wood, and fiberglass, and were believed to be the largest structures of their kind in the world at the time. Since there were no existing samples to work from, Disney artist Gary Graham following Graves' design, sculpted the swan models out of Styrofoam and these were then computer photographed (photogrammetry) in a process that turns the shapes into a digitized database. The photogrammetric information was then sent on to a shipbuilding company in Wisconsin. There it was put into a computer that automatically cut the wooden ribs to exact specifications and imprinted the ribs with numbers and location directions. The ribs were then delivered to the statue site, where they were fitted to a steel frame. Once assembled, a fiberglass covering was carefully brushed on and then covered with five layers of laminate. The swan statues were then sanded, painted and ultimately lifted into place on May 1989. Completed, the swan statues, referred to as "heroic" statues, are 47 feet high. And at a combined weight of 56,000 pounds, they required a multi-ton 70-foot crane to lift them up atop the hotel. They were placed on specially constructed pedestals at either end of the hotel's roof, which support and display them. The dolphin statues are 63 feet high and some Disneyphiles referred to them as "Flipper's Tomb" when they first appeared. All the roof sculptures are hollow inside, except for the structural beaming, and they have internal staircases and trapdoors for maintenance purposes. At the Walt Disney Dolphin, the sculptures are three-dimensional where guests can't touch them and two-dimensional, like in the indoor fountain, where they can be touched. At the Walt Disney Swan, it is reversed and the sculptures are generally three-dimensional where they can be touched by guests (like the interior fountain), but two-dimensional (like the monkeys and parrots) where they can't be touched. Where is the entrance to the Walt Disney Dolphin? No, it is not at the porte cochere (where cars drop off their passengers). It is facing the Walt Disney Swan. The dolphins in the fountain facing the Walt Disney Swan were supposed to be three-dimensional, but Graves was told to space them out wider because they obstructed the view. Instead, Graves simply sliced the dolphins, making what he called "dolphin filets," and keeping them exactly where they were but opening up the space. He also made the fountain smaller since the dolphins are now two-dimensional and needed to be able to be touched. When you enter a hotel, the check-in desk is usually on the right-hand side because most guests are right-handed. In the Walt Disney Dolphin it is on the left-hand side. The tent-covered rotunda is also disorienting without landmarks or icons for guests to determine which direction they need to go to get to their room. These were deliberate choices to create a sense of disorientation by Graves. "It was to be a hotel for conventions and when you attend a convention, what do you want the participants to do? You want them to think differently, to see things from a different perspective. So the design is encouraging that," said Graves. The Walt Disney Swan is completely different. The entrance is where the porte cochere is. The check-in desk is on the right hand side. The hallways are designed in an angular fashion so that is it easier to locate where you are and where you might want to go. Graves partnered with interior design firm of Wilson and Associates to create rich beach-themed color schemes, hand-painted murals, lily pond carpets, room doors painted to look like striped cabanas, sea shell light fixtures and more to capture the spirit of a playful tropical beach. "Both inside and out, the hotel was designed to echo the tropical Florida landscape, as well as the fun and whimsy of the nearby Disney attractions and an aura of fantasy that appeals to guests of all ages," said Graves. The hotels have now transitioned to what is called "modern luxury," which means the design will be less thematic of a playful beach story and more opulent than before. Graves was involved in the room redesign, but not in the makeover of the public space. Both lobbies have been redesigned, and the work is expected to be completed by mid-September. The centerpiece fountains will go from their original blue-green color to a bronze tint, and the billowy, circus tent-like ceiling in the Walt Disney Dolphin lobby is being replaced by a more sedate fabric. Cylindrical chandeliers, woven metal and hand-finished wood are replacing fish-shaped lamps and artificial plants. So another storyline disappears from Walt Disney World property, but I suspect there will be few mourners of the attempt of Michael Graves to capture the Disney spirit without Disney characters. In fact, for me, the story disappeared almost 15 years ago when neither cast members nor guests understood nor appreciated this postmodern story that was the beginning of Eisner's entertainment architecture legacy.